History of a Crime. The Death of Baudin. Victor-Marie Hugo. Home » History of a Crime. The Death of Baudin. Victor-Marie Hugo. 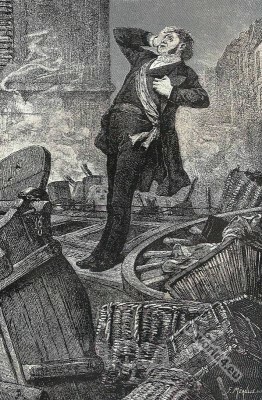 The Death of Baudin. History of a Crime by Victor Hugo. BEFORE being a Republican, Baudin had been a tutor. He came from an intelligent and brave race of schoolmasters, ever persecuted, who have fallen from the Guiot Law into the Falloux Law, and from the Falloux Law into the Dupanloup Law*. The crime of the schoolmaster is to hold a book open; that suffices; the Church condemns him. There is now, in France, in each village, a lighted torch – the schoolmaster, and a mouth which blows upon it-the curé. The schoolmasters of France, who know how to die of hunger for Truth and Science, were worthy that one of their race should be killed for Liberty. Hugo’s “History of a Crime.” J.-P. Laurens, Artist. F. Méaulle, Engraver. Victor-Marie Hugo 1802-1885, was a French writer. He wrote poems and novels and plays and worked as a literary but also a political publicist. His work is part of the romance, partly associated with the realism. About a quarter of his texts after 1849 are politically motivated and committed. His position seems contradictory at first glance: He defends the profit motive and speaks at the same time for social justice. He is liberal, but against people who accumulate profits rather than reinvesting the benefit of all. Several of his works have been set by the Vatican on the Index of Forbidden Books. * Félix Antoine Philibert Dupanloup 1802-1878, was a Roman Catholic Bishop of Orléans. Temporarily headed Bishop Dupanloup the Petit Séminaire de la Chapelle-St-Mesmin near Orléans, where he also the young Paul Gauguin taught in Catholic liturgy and philosophy, which should greatly influence his artistic development. In 1875 he published his book against Freemasonry: Etude sur la Franc-Maçonnerie. During the mid-19th century he was spokesman for the liberal wing of French Catholicism. This entry was posted in 19th Century, France, Genre, Romantic Era and tagged Character sketches, Romanticism fashion on 6/10/15 by world4.